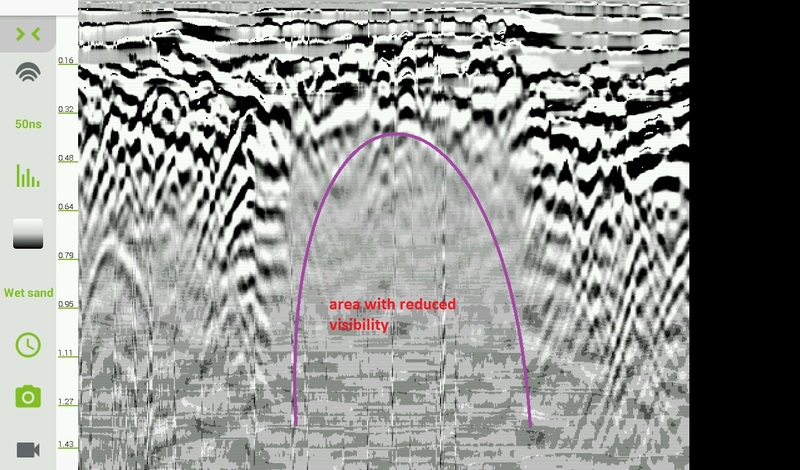 The easiest way to increase your GPR's penetration depth is by setting to work at its longer operational time window. The background removal filter is a very powerful tool for every surveyer. It effectively adapts to the surveyed material, removing patterns that are not of interest to the surveyer - the background. 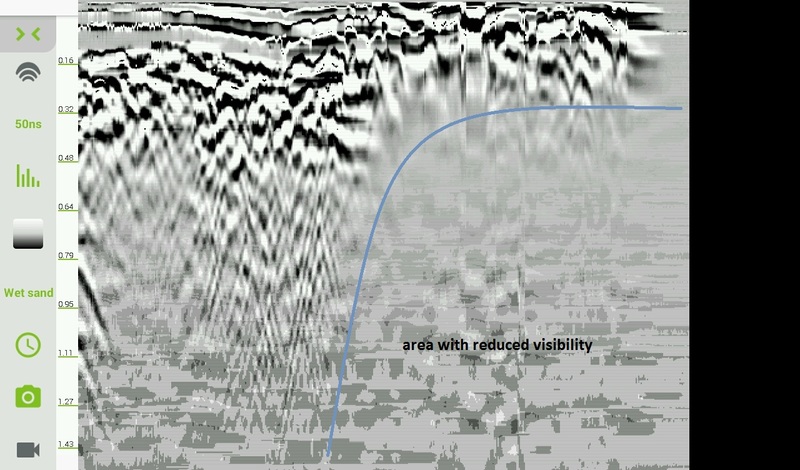 A common pitfall of the background removal filter is when doing very long surveys it can cancel out some underground features are very big and gradual in nature. Perfect for making features smaller than 5 meters stand out - pipes, buried objects, cavities, walls, etc. The Oerad App allows you to apply an algorithmic amplification of the signal from your GPR in different parts of a single trace. This is useful when a surveyed material is rich in anomalies in the shallow subsurface but the surveyer is interested in features at bigger depths. Amplify signal from GPR via hardware gain. Allows differentiation of materials with similar electric properties - i.e. adds contrast to your radargram. Useful for focusing on structures at greater depths. Works well with a negative software gain filter applied to the upper part of the trace signal. Air has a low dielectric so EM beams from the GPR travel at almost the speed of light and over a broader area, accounting for signal loss. Close coupling with the ground reduces this effect significantly - focuses the beam into the ground. Dipolo systems can be recentered via the hardware switch on the Receiver module depending on their height above ground. The nature of the GPR architecture and operation by design are such that the receiver antenna listens to all events or signals within its operational bandwidth. Cellular towers, WiFi from mobile devices, electrical powerlines or other radio emitting devices sometimes emit signals in the same bandwidth as of the receiver's antenna of a GPR. Humidity is the most common reason for signal attenuation (or signal loss). Please refer to the section on how to Spon an area with low to no visibility. Even little humidity in a material can greatly skew depth calculations. It is recommended to avoid doing surveys after heavy rainfalls. Some soils contain humidity rich or other low penetrability areas that can obstruct surveying. These can easily be spotted as seen in the images below. and t = operating time window. Conductor materials such as aluminium, copper and gold have a dielectric constant approaching infinity. That is why it is impossible to 'see' beneath conductive structures. It is important to note that although all Oerad GPRs are thoroughly calibrated to cm level precision in laboratory conditions, in outdoor surveys it is rare to find perfectly homogenous materials. 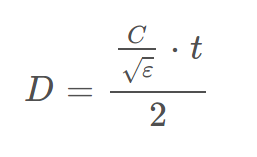 This formula is used as a reference for better understanding radargrams. Refer to the Dielectric cheat sheet below for common materials and theoretical maximum achievable depths with Oerad GPRs. When an EM beam travels through the ground and encounters different materials it can reflect, refract, transmit or attenuate. Some object with cavities within them such as pipes reflect can produce double or tripple reflections. This occurs when part of the beams reflect off the top of a pipe, others are transmitted and reflect off the bottom of a pipe. This is defined as the minimum distance between two objects horizontally or vertically for a GPR system to be able to discriminate between them - or show them as separate hyperbolas. Depth values are in meters.